(Newser) – Families split by the Koreas' North-South divide could soon be reunited for the first time since the Korean War's 1953 end, though uncertainty remains. The North today agreed to talks aimed at planning the reunions, which the South has proposed run from Feb. 17 to 22, the New York Times reports. Seoul wanted to hold the planning talks last Wednesday, but the North gave no reply for a week; the two sides have now settled on this Wednesday. 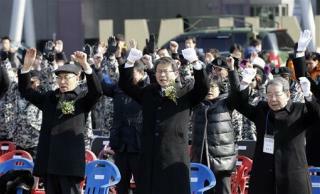 Such reunions have occurred 18 times previously, beginning in 1985, bringing together 22,000 Koreans. They'd best be doing these reunions real quick before it's too late, since most of the old folks are dying away. Sixty years is a long time. Technically, the war didn't end in 1953, it went under cease fire. Little importance, but truth. Gee isn't it about time to come out of your cave N.Korea?